Heavy rain fell throughout the day for the opening two practices at the season-ending Valencian GP in Spain on Friday. 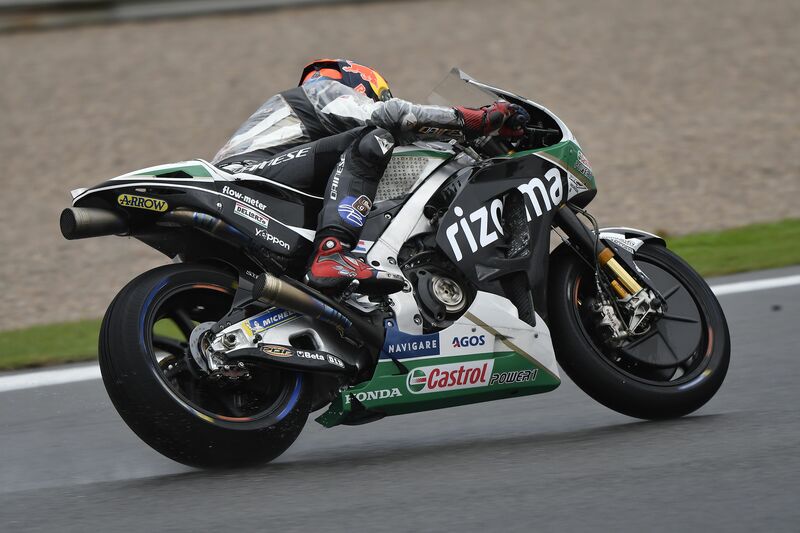 For Stefan Bradl, Cal Crutchlow’s replacement rider at LCR Honda CASTROL, it meant getting up to speed with the Rizoma branded factory Honda RC213V in treacherous conditions, but the 28-year-old acquitted himself well. The German HRC test-rider impressed particularly in the first free practice session, consistently sitting in the top ten positions, but missed out on a fast lap when conditions improved towards the end of the session. A red flag halted proceedings in both practice sessions because of standing water, but it didn’t come to Bradl’s rescue in the afternoon, when he had a small crash after hitting a puddle at turn 12. However, he is confident he has found a good setting on the machine, and is hopeful of securing a spot in qualifying two. “They were tricky conditions today because there was so much rain throughout both sessions. Everyone was a little bit worried about the quantity of rain tyres that we have, so we didn’t make as many laps as we would normally. It was good though, and I got up to a decent pace quite quickly, so we can be happy and satisfied with the situation.” “This afternoon the rain came again and there was no sense to do the whole session, and we tried to save tyres a bit. Unfortunately, we went out again and tried to make a couple of laps. My feeling was very good on the bike, which is the positive. However, I lost the rear and had a small crash, but everything was ok, I wasn’t injured.